This was going to be another post about how I see Doctor Who connections everywhere, ’cause I spotted the Doctor’s Daughter and Rory’s Dad in a BBC Mystery. Then the channel started glitching and I had to jiggle the antenna (yes, I still use an antenna). As usual, the picture cleared up as soon as I touched the pole holding it, and went all squiggly when I stepped away. 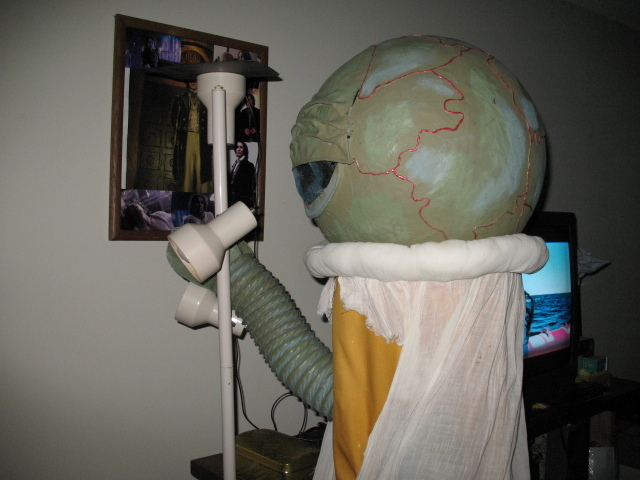 Luckily, a prop brought back after Time Lord Fest was nearby, which made a fine replacement. 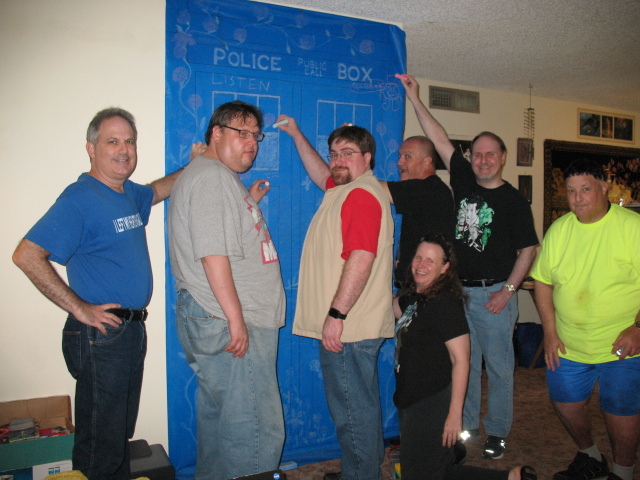 Time Lord Fest was a blast, and we were able to bring almost all our ‘stuff’–thanks Ken! 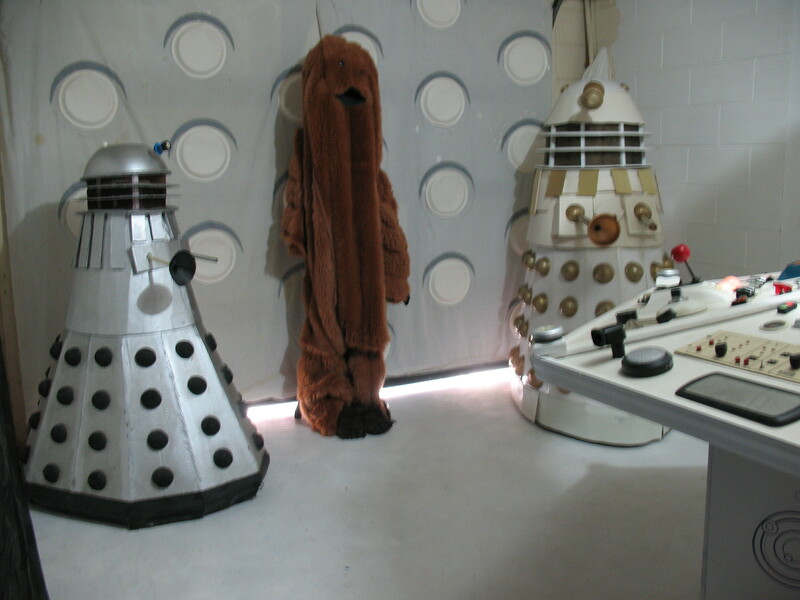 We set up games for the event: Bowling for Daleks, DW Trivia Dominoes, Cyberdarts, Pin the Tail on K-9, and DW Pictionary (TARDIS Console Beanbag Toss not pictured). 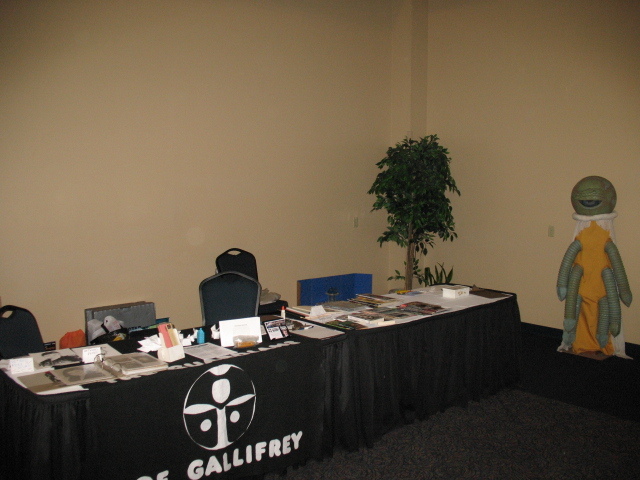 The Club table, loaded with freebies, was next to our merchandise table guarded by the Delegate from Alpha Centauri. 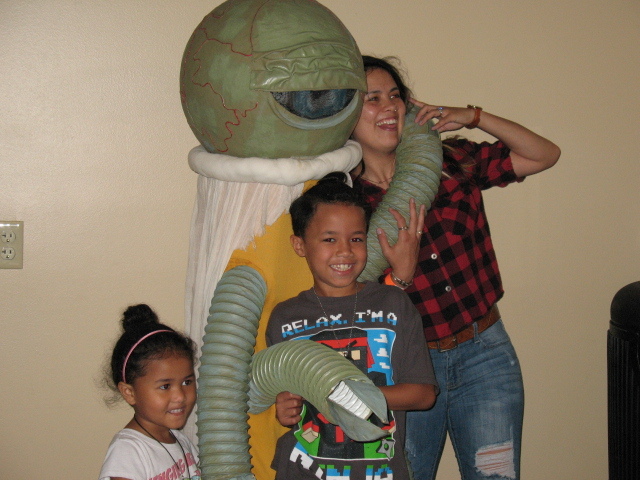 Alpha Centauri was very popular! …to make up for missing last week. 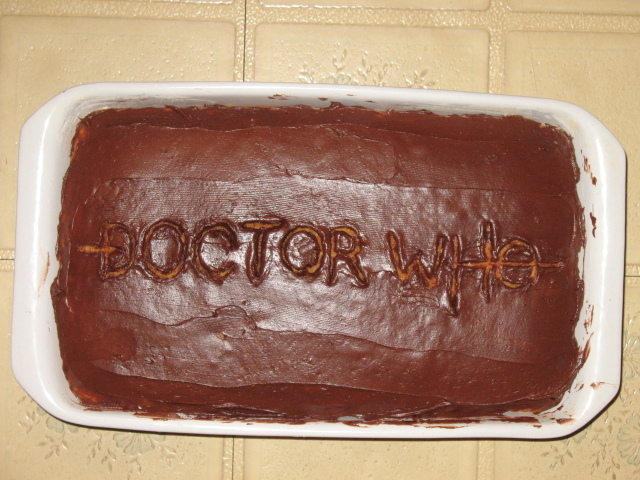 First, more evidence of my Doctor Who addiction: seeing reminders of the show everywhere. 2) Dan Starkey’s name was in the credits. If you receive the Gallifrey Guardian newsletter, you will know about BBCAmerica’s request for welcoming messages from fans for Jodie Whitaker in her new role. While video is preferred, they will also accept artwork, cosplay photos, etc. Below are the messages I sent from myself and my granddaughter. Now I can concentrate on Party prep again–Saturday is almost here! GoG’s Anniversary Party will be held from noon to midnight on Saturday, June 9, which means I’ll be frantically prepping for the next week. 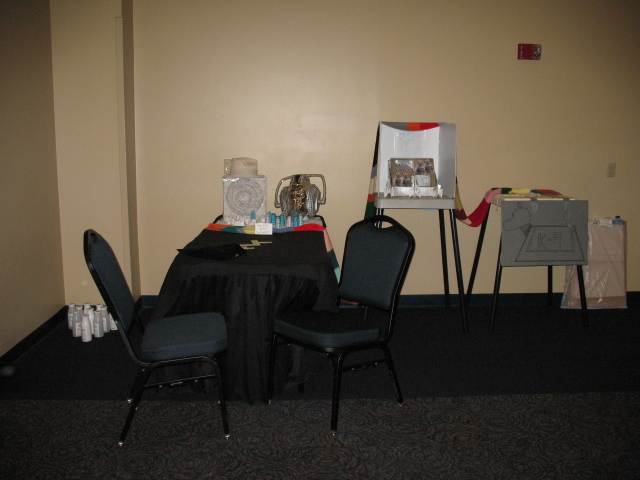 Guests will enjoy food, Doctor Who viewing, trivia, games, and photo ops–in the TARDIS console room and with Daleks and the Delegate from Alpha Centauri. Fans can bring Doctor Who memorabilia to show off, create a paper K-9, Dalek, or TARDIS, or buy DW books/magazines/comics (got a great deal–25 cents!–on bagged and boarded back issues). We’ll choose a non-Who film for our (ends at) midnight movie, most likely superhero or Star Wars-themed. A group outing to see the Paint the Trail TARDIS is a possibility for the following day–could make a great group photo op!